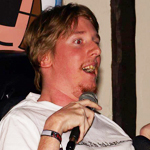 Wise Crack Comedy was established in 2013 by regular Comedian and Comedy MC Jamie Green. Jamie has years of experience on the open mic comedy circuit traveling up and down the country bringing his own brand of “sit down comedy” regularly making audiences roar with laughter. Jamie is a regular visitor to the Edinburgh Fringe. Early in his career, as a media student, Jamie wrote for ‘BBC Ouch’ and ran a comedy blog, featuring interviews with many of his favourite comedians; long before they became famous “Comedians – off the telly”. These included Micky Flanagan, Russell Kane …. Hi there .. I am a student in Cambridge and I love Comedy … I wanted a great night out …. The Tram Depot – on the THIRD TUESDAY of EVERY month and now also at The MED on the FiIRST WEDNESDAY of EVERY month. Q – When is it ? at The MED on the FiIRST WEDNESDAY of EVERY month. Q – Where is it ? Q – Where are they ? Q – How Much ? Q- What time is it ? Q – Can I get something to eat ? Q – Have they got all the usual drinks ? At The Tram Depot they have all the drinks – including some good real ales but they havn’t got ‘Guinness’ they have ‘Titanic’ – goes down even easier than Guinness !! At The MED they have all the drinks AND real ales Inc Adams lighthouse and Sharps Doombar. Q – Can I find out more about the venue ? Q – Have they got a web site ? Q- Are the venues wheelchair accessible ? Yes otherwise I can’t get in …… which is more than can be said for many venues …..
We are going to CRACK you up – So it would be WISE to get along and join us …. Find us on FACEBOOK at …. on the THIRD Tuesday of EVERY month. Great FOOD available before and during the show (which is totally optional) ……. AND … ITS FREE …. The Comedy that is !!! LOL …. I know amazing ! !